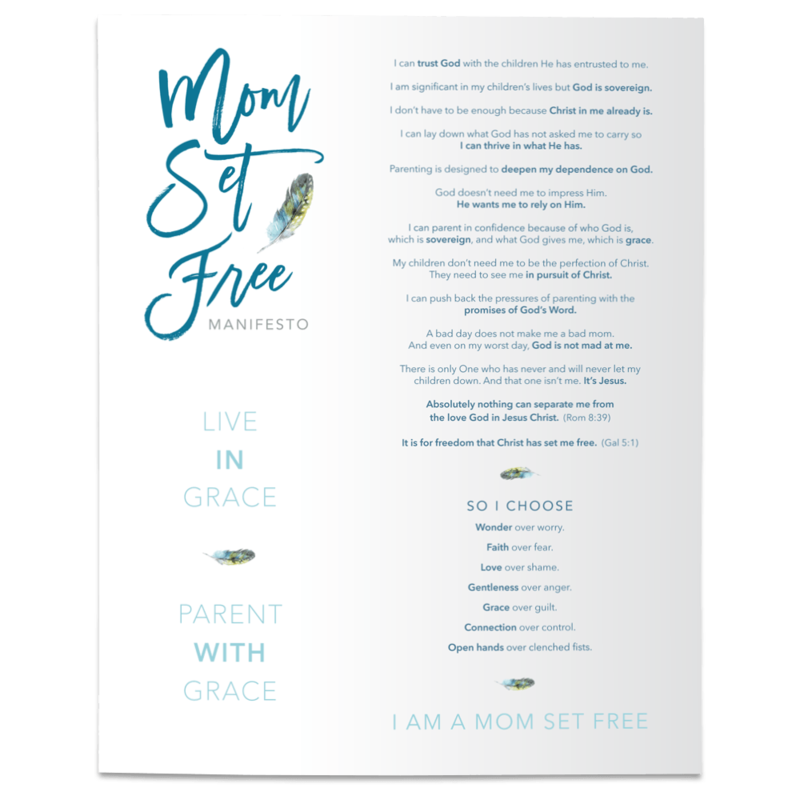 Several months ago I asked for your help in choosing the cover for my new book and Bible Study, Mom Set Free. Well, you all blew me away with your responses and encouragement. The vote was overwhelmingly in favor of Option B. So it’s with much excitement and gratitude that I launch my new website today, featuring the covers that YOU chose, and share with you more about this journey that God has used to teach me how to live and parent in freedom. This book is deeply personal. It chronicles my journey of finally accepting that nothing - absolutely nothing - can separate us from the love of God in Jesus. It reveals how I shed the shame that I was shrouded in for entirely too long. And it offers the ways in which God continues to teach me (mostly through my mistakes) how to demonstrate His heart of grace to my kids. Friend, I don't hold back in this book because I want each and every one of us to be empowered to parent in the freedom- the very real freedom – for which Christ has set us free. Freedom from the pressure to be perfect for our kids. Freedom from the pressure to perform for the love and acceptance of God. Freedom from the pressure to pretend we have it all together in front of other moms. In fact, when another mom recently said to me, “I feel like four kids is a lot for you” and in response I laughed hard and responded, “You are so right, sister. Four is a lot for me. Thank God for Jesus!” it was sweet confirmation that I am indeed learning to live as a Mom Set Free. I know I’ve been a bit quiet on the blog lately. But I want you to know it’s only because I’ve been learning how to do life with another beautiful baby boy in the house. Over the last year I've attempted to be a wife to Mike, a mom to four energetic boys, and a writer, in that order. I haven’t always gotten it right. But nonetheless, the blog had to take a back seat as I've poured my heart into this book and Bible Study. *** Don't fear. I know they say you get more relaxed as you have more kids but we aren't as "relaxed" with our fourth child as this picture suggests. I was photoshopped out of it. The good news is that anything and everything that God has taught me - so far - about what it means to parent in the freedom of Christ is in Mom Set Free. And I truly believe that God has an extraordinary adventure in store for those of you who will join me on this journey to living as a Mom Set Free. Are you with me? Please say yes! Together we will be reminded that who God is, which is sovereign, and what God gives us in the person and work of Jesus Christ, which is grace, is enough – it’s more than enough- for the pressures we face as moms. We will discover, together, how to push back the pressures of parenting with the promises of God’s word. And we will walk in freedom from the worry and fear and guilt and anger and comparison and shame that we too easily get stuck in. Doesn't that sound so good? You can subscribe here to stay posted on the latest news and give-aways and pre-order promotions. And you can go ahead and pre-order the book here if you’d like! I'm so excited about going on this journey with you because becoming the moms we want to be doesn’t happen by trying harder to be better tomorrow. It happens as we remember and rest in who Jesus has already been for us! It happens by more deeply believing that the Gospel is for us.